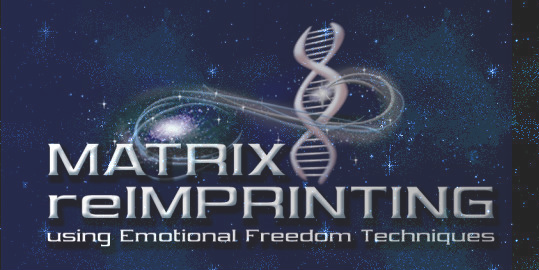 Matrix Reimprinting is a new Meridian Tapping Therapy that's effective for the treatment of emotional or physical issues and can also be used to manifest your goals and dreams. It was created by EFT Founding Master Karl Dawson as an evolution of the popular EFT self-help technique. Like EFT, Matrix Reimprinting uses the traditional Chinese medicine meridian system used in acupuncture for thousands of years. EFT has a long and impressive history resolving physical and emotional health issues and works by bringing to mind and verbalising in a specific way an issue you want to work with, while at the same time tapping on points on your meridians with your fingers. This releases stress and trauma from the body’s energy system, allowing the body-mind to return to a healthy physical and emotional state. Results for EFT have always been phenomenal and have far reaching positive implications for our Western medical model of healing. Matrix Reimprinting contains some important differences from this established technique. For example, with conventional EFT tapping on meridian end points is used to take the emotional intensity out of a past memory. What this produces is the ability to recall your most traumatic and stressful life memories without any emotional disruption or stress, which is obviously extremely useful as negative past memories keep the body in a state of stress and can contribute to disease. However with Matrix Reimprinting the memory is actually transformed - you can go into any past memory and say and do what you wished you’d said and done, bring in new resources and create and transform the picture you have of that memory. Matrix Reimprinting sees these negative past memories as being held as pictures or holograms in your body's energy field. Until you transform them you keep tuning into them at a subconscious level, affecting your health, your wellbeing and your point of attraction. Changing the pictures creates both physical and emotional healing and enables you to attract more positive experiences into your life. By tapping on the body's meridians at the same time this process is accelerated. Angela and Matt are highly experienced Matrix Reimprinting Practitioners and EFT Master Trainers and have assisted Karl Dawson, Matrix's creator (pictured) on his Matrix Reimprinting Practitioner trainings. We bring to Matrix Reimprinting many years experience working with all kinds of problems including severe anxiety, trauma, abuse and physical health issues.